First published: London, Chapman and Hall, 1881 3v. …possibly the most unjustly neglected of all Trollope’s novels … and yet it is one of the most charming of all the long list. It is the lightest and airiest of them all, it has a gaiety and happiness and playfulness that Trollope, gay and happy though he often was, never exceeded…. what vigour of scene and creation, what vitality of action and dialogue it contains. 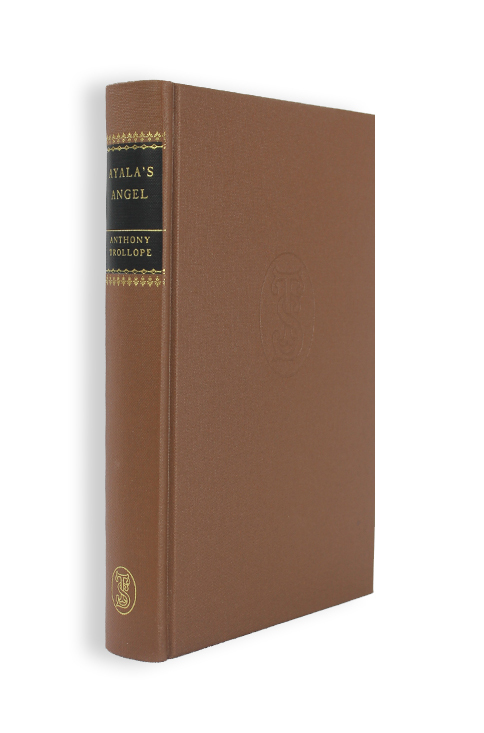 Ayala’s Angel stands out among Trollope’s novels for its lightness of touch and its light-hearted, sunny atmosphere. It tells the story of the orphan daughters of a charming, feckless artist, Egbert Dormer, who dies leaving no inheritance at all to his two attractive girls except their looks, and the innocent confidence bestowed by their family’s improvident Bohemian lifestyle. Two quite different branches of the family come to the rescue. They are united on only one point. The girls must be separated. The more spectacular of the two, Ayala, is to live a life of luxury with rich cousins, the Tringles. Her quieter sister Lucy is incarcerated in the gloomy suburban fortress of the Dosett family where, it is made plain, her presence is felt to be an extra burden on a fragile household economy. It takes girls of some spirit to survive such ordeals. Ayala’s misfortune is that the callow Tom Tringle falls for her. When Ayala complains to Lady Tringle that she is being pestered, Lady Emmeline’s latent dislike of this attractive girl with her unsuitable back ground rapidly surfaces. ‘I suppose you have encouraged him’. ‘He is a lout: a stupid lout. I have not encouraged him’. ‘Ayala, you are very impertinent’. ‘And you are very unjust. I want to put a stop to it. I come to you, and you tell me that I encourage him. You are worse than Augusta’. The result of the ensuing row is that the girls are not re-united, but — incredibly — swapped: exchanged like unsuitable dresses. Brainless luxury is inflicted on Lucy: cheese-paring penance on Ayala. Trollope elegantly demonstrates that neither of these ways of living is tolerable. The girls, remarkably uncrushable, contrive their own solutions. Lucy’s pursuit of a penniless young sculptor is successful, at last, despite the ill-fitting trammels of luxury thrown round her. While Ayala’s frantic search for an ‘Angel of Light’ eventually reaches fruition in a love match with an ugly, witty, authoritarian Colonel with red hair, who offers her sanctuary in the civilised world of the English Gentleman: a world vastly superior to the bogus versions she has rejected before.